Follow the recipe for Flan de Coco, add 1 8-oz package softened cream cheese. Mix the cream cheese first with the mixer then add the eggs, then the rest of the ingredients. YUM! Preheat oven to 350°. Prepare bain-Marie and caramelize the mold as per instructions at the top of this page. Add the rest of the ingredients. Blend smooth but do not over mix. Pour custard into caramelized mold, cover with foil, and sit in the baño de María. Then pour hot water into the baño and into the oven for 1 to 1½ hours until done and knife comes clean. Preheat oven to 350°. Prepare bain-Marie and caramelize the mold as per instructions at the top of this page. . Mix eggs with an electric mixer. Add the rest of the ingredients. Blend smooth but do not over mix. Pour custard into caramelized mold, cover with foil, and sit in the baño de María. Then pour hot water into the baño and into the oven for 1 to 1½ hours until done and knife comes clean. Preheat oven to 350°. Prepare bain-Marie and caramelize the mold as per instructions at the top of this page. Beat the cream cheese with an electric mixer until smooth add eggs and mix. Add the rest of the ingredients. Blend smooth but do not over mix. Pour custard into caramelized mold, cover with foil, and sit in the baño de María. Then pour hot water into the baño and into the oven for 1 to 1½ hours until done and knife comes clean. Preheat oven to 350°. Prepare bain-Marie and caramelize the mold as per instructions at the top of this page. Mix eggs with an electric mixer. Add the rest of the ingredients. Blend smooth but do not over mix. Pour custard into caramelized mold, cover with foil, and sit in the baño de María. Then pour hot water into the baño and into the oven for 1 to 1½ hours until done and knife comes clean. 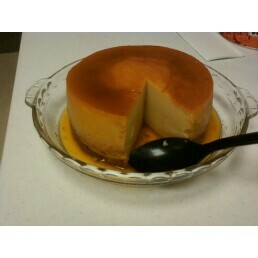 Mami used to make the most delicious flan than none of us have been able to match. It was a thick flan and it was always perfect. With a microwave flan, there is no need for a baño de María. You will need a caramelized pan prepared the same way. The pan must be microwavable. This flan cannot be too large. Use only 6 eggs at the most. Test it out in your microwave before you serve it to anyone. I made it in my old microwave and it was good, but not so in my new microwave. Beat eggs, add the other ingredients. Cook in the microwave at 50% power for 7 minutes, then cook at 100% power for 8 minutes. A knife inserted into the center of the flan should come out clean when it is done. If it is not done after the 8 minutes, cook at one minute intervals, checking each time. Cool and refrigerate before serving. No need for a bien-Marie or baño here. You will need deep a caramelized metal pan that fits in your pressure cooker. 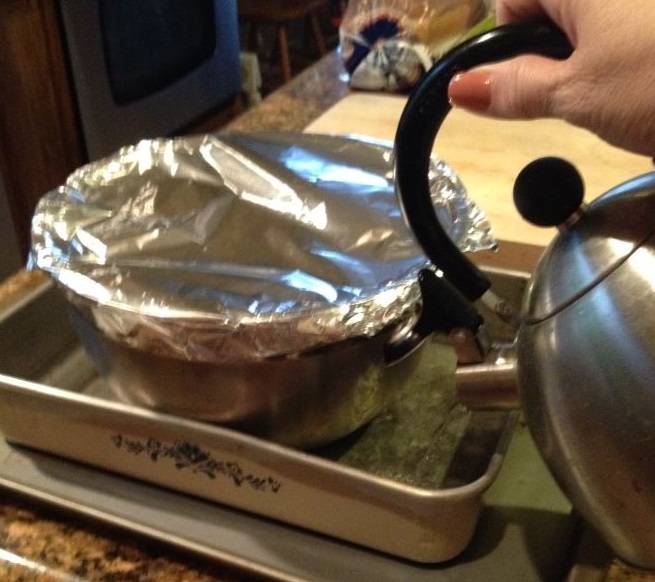 Use a simple pot without handles and a secure lid. There should be enough room between the caramelized pan and the pressure cooker so that the pan can be lifted out when done. Follow your recipe. Pour into caramelized mold and secure with lid. If no lid, cover with foil and secure with rubber band. Carefully lower the mold into the pressure cooker with about 3" of water or no more than half way up the mold. Secure the pressure cooker lid and lock it. Cook for 50 minutes after lowering heat. Turn it off. Let it cool down enough to open the cooker lid. Then let this cool down enough again to lift the mold out. 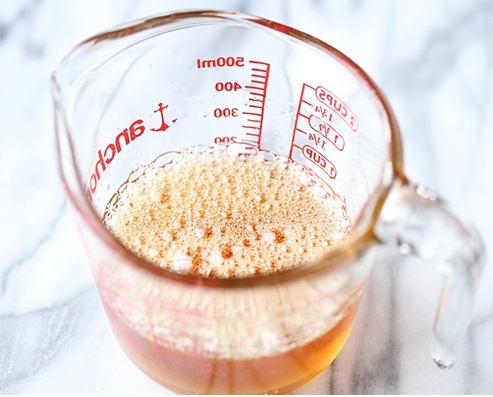 Once it gets to room temperature, refrigerate for at least 6 hours before serving. If making a larger flan add additional time.